This is the first newsletter to come through the new site. I do hope you will have a look and let me know your thoughts on how it looks.This link will take you straight there. I was very lucky to be able to attend this years Festival of Quilts in Birmingham .Wonderful and gorgeous quilts on display also there were a number of exhibitions of the Art Quilts that were amazing and I really enjoyed the demonstrations by many quilt artists.Click here to view the winners. It helps when Darling Hubby needs to be in the UK at the right time of the year. I have taken some pictures for you to have a peek at. The details of each artist follow the photo. Click here to view. I came away feeling very inspired. If you ever have the opportunity to visit the UK, do go while the Festival of Quilts is on in Early August. Between trips I did receive some new stencils and you can view them on the Stencils and Stamps Page. They are listed on the first three lines of the page. 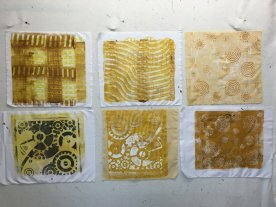 Also managed to create some Gelli printed backgrounds for the Aotearoa Quilters Yellow challenge.I did complete 4 pieces and will post these on my facebook page as soon as possible after they are exhibited at the Orchid and Flower Show in Auckland. To celebrate the colour Yellow and my new site I will reduce the price on all yellow products by 15% this includes any paint or any fabric. When ordering please note the amount charged will be the full price I will reduce your payment amount by 15% before processing your card. I have just listed the Gelli Plate Minis there are two sets. One contains a Round, Square and a Triangle the other Rectangle,Hexagon and an Oval. I have added a link on the page so you can see them in action. This is a little piece of cotton batting painted with Dye na Flow then stamped with the Minis and finally embellished with threads. With all the ideas buzzing in my head I am going to keep this short and sweet.